Another one of my ideas of putting together characters from different scans in one wallpaper. My UlquiHime fangirl inside led me to color Ulquiorra's and Orihime's outfits in the same color to match. It was great to vector my favorite characters. Seriously, I was charmed by Uryuu's pose there. Gotta love him. And Toushirou-kun is so striking and cool. I love how Ulquiorra-sama and Orihime turned out here. Those two were just edited. While I usually adore a happy Orihime, I find her beautiful with a serious expression too. Just weird... 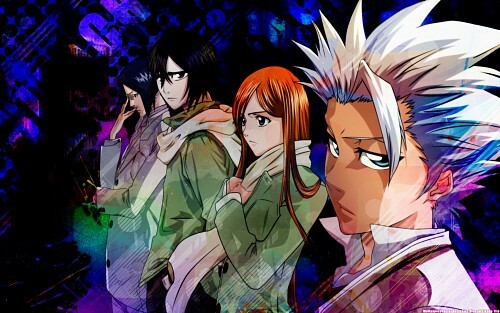 I think Orihime was not in the original picture XD... but i love Hitsugaya's look... mmmmmh, how such a tiny boy can be soooooooooooo cool? It's awesome ! ah wish I could do all those cool efects and things... Thanks for sharing it! Orihime and Ulquiorra were not in the original scan, right? But you've added them so perfectly and made it look so original. I'm loving the green colors on her. Orihime's expression is beautiful here. The colors just dazzle me, along with the amazing effects you've put up. It's definitely worth the fave.